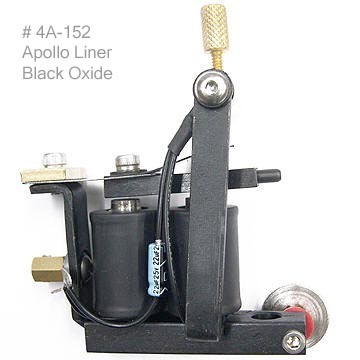 Apollo Tattoo Machines with Interchangable Chucks. Light weight, compact and strong. Avilable in Liner and Shader. # 4A-157 Liner, # 4A-158 Shader, Black Frame with Chrome Plated Aluminum Chuck. # 4A-152 Liner, # 4A-154 Shader, Black Frame, Black Lever Chuck. # 4A-153 Liner, # 4A-158 Shader, Silver Anodized Frame, Silver Anodized Lever Chuck.